Halloween is just around the corner…let's get into the haunting spirit early with some gloulish disco grooves courtesy of a group that called themselves Hot Blood! Not long ago I posted about a European disco dance troupe called Ballet Zoom, which included a performance to a song called "Soul Dracula." 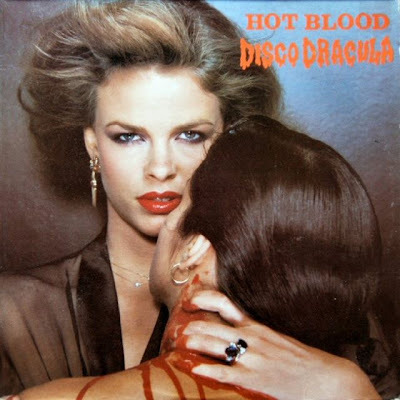 I couldn't get the song out of my head and discovered that it's credited to a group called Hot Blood...which put out an album in 1977 called Disco Dracula. Technically, Hot Blood wasn't so much a marketed group as it was a bunch of session musicians brought together for the purposes of putting out an anonymous German novelty disco record. There are only seven tracks and today was my lucky day considering some kind retro soul had uploaded all of them to Grooveshark. I love that song. I love music that has a Halloween/monster theme. This is a cool little music player, nice blog feature! Believe it or not, I actually own this LP. I have a soft spot for novelty Halloween/horror records.